The Brief: To "dog walk" means to drag someone on the ground during a fight. “Dog walk” is a metaphor for beating someone up. The image that it conjures is of someone dragging another on the ground during a fight as if they were walking a dog on a leash. Dog walk can also be used in reference to verbally dragging someone. This term rose to mainstream popularity after Cardi B used it as a clapback to settle Twitter beef with conservative pundit Tomi Lahren. On January 17, Cardi B posted a video criticizing the government shutdown and President Trump’s border wall. Then, Tomi Lahren Tweeted “Looks like @iamcardib is the latest genius political mind to endorse the Democrats. HA! Keep it up, guys! 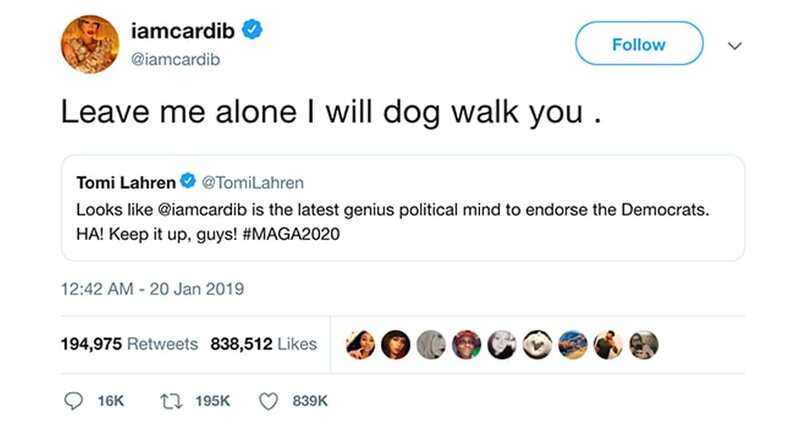 #MAGA2020.” On January 20, Cardi B responded “leave me alone I will dog walk you” in a tweet that went viral, gathering over 800,000 retweets. Since then, the phrase has exploded in popularity. The dispute continued from there, but to many, Cardi’s dog walk comment ended the argument with Cardi as the winner. Time to catch up on the fighting terms molly-wop, drag, and beat the brakes off, all phrases that have been spoken and popularized by Cardi B.
I love that Cardi is shedding light on all of us who once yelled we’d dog walk somebody. Etc. etc. all terms many of us been knew and understood.